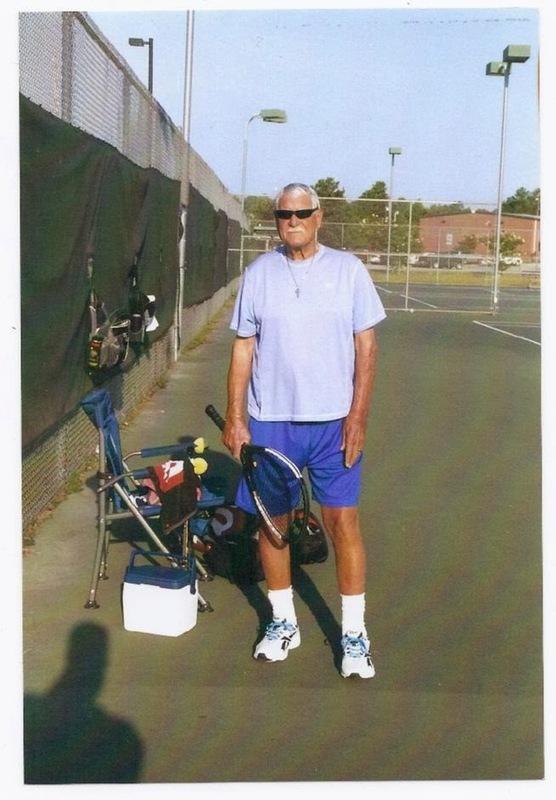 Moose, C. Robert Kahle, founder of the in/famous Moose Tennis League, passed on, not away, December 31st, 2013. I didn't know what to think of Moose at my first Moose League outing. I didn't need to - he's a humble, inviting and witty guy. And, I didn't and still don't know much about Moose. Again, I don't need to, didn't necessarily want to. He's that kind of guy. What I learned about Moose came from his presence, our brief asinine conversations or from me posting a few things about him and The League on this blog. But, I truly enjoyed speaking with him, both of us providing some commentary about what was taking place on the courts at the time. He was as much fun during play as he was off-court and he gave it his all in light of some limited mobility in his later years. Did he teach me anything about tennis? Not much, except how to cover more court, his portion of it, and some. And, although I believe I possess fashion-sense, he did remind us all, by example, of the importance of color coordination while partaking of the sport. Fortunately, Moose only chastised me once, although repeatedly, for not rotating out of play after sets. He knew why during those hotter months. I had the good fortune of seeing him during his last few days. It was brief and we laughed together. That was what I hoped for and more than I could have asked for. He's a calm, fun-loving, respectable and respectful man and although I wish he was still here, and I'm certain many others do as well, he's probably relaxing somewhere in his court-side chair, laughing at and with us all. My sympathy and best of wishes go out to his family and all those affected by his demise. I believe all those who knew him will agree - he didn't pass away, he passed on...a lot. His obituary in The State newspaper can be found at http://www.legacy.com/obituaries/thestate/obituary.aspx?n=c-robert-kahle&pid=168926331&fhid=7719.